I’ve been wanting to get up here for years and finally I did it. It was brilliant. All sculpture and all amazing, well apart from that awful spider by Louise Bourgeois! 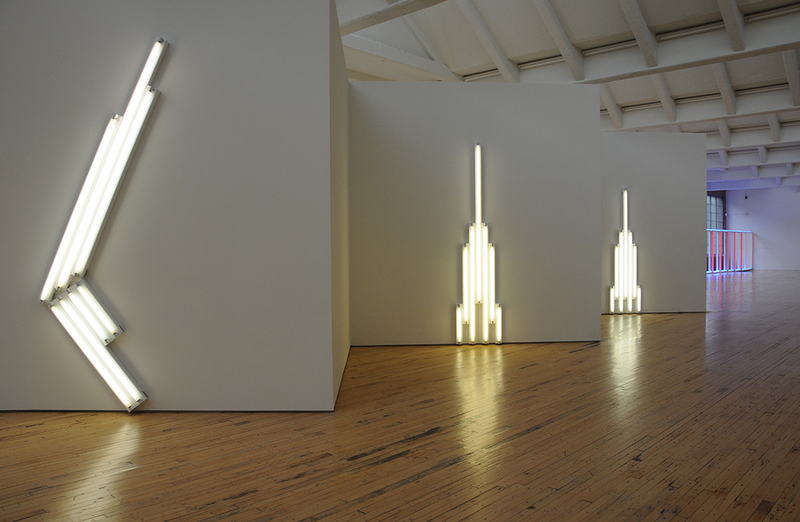 I knew there were some Dan Flavin pieces there- so that’s what I went looking for first, past the chunks of metal cars and colors of John Chamberlain. …and into the light, just something about the light that I love and Flavin’s a master of light and colour. 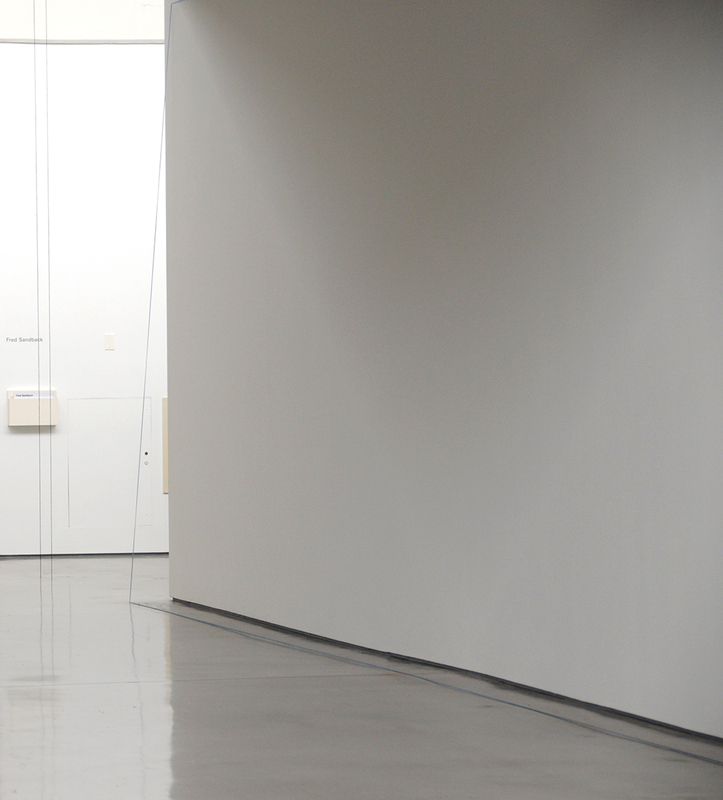 I don’t usually take pictures in galleries/museums but I couldn’t resist here. 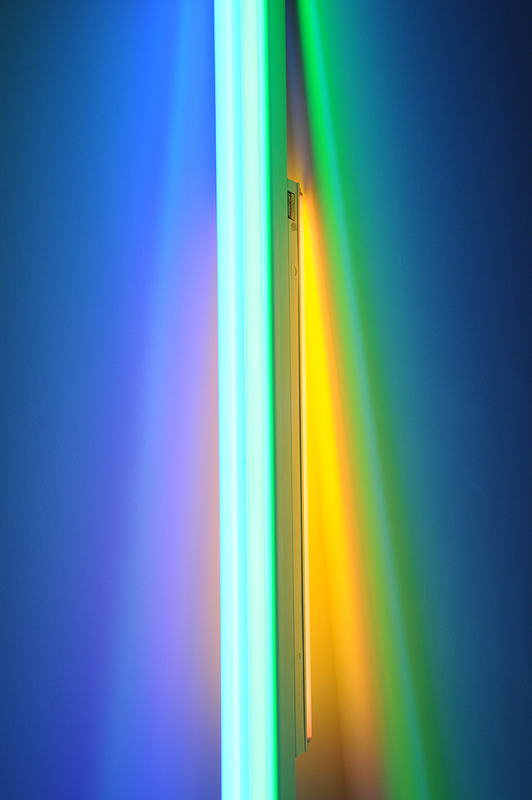 Flavin had one big freestanding piece and in the same room a zig zag wall. 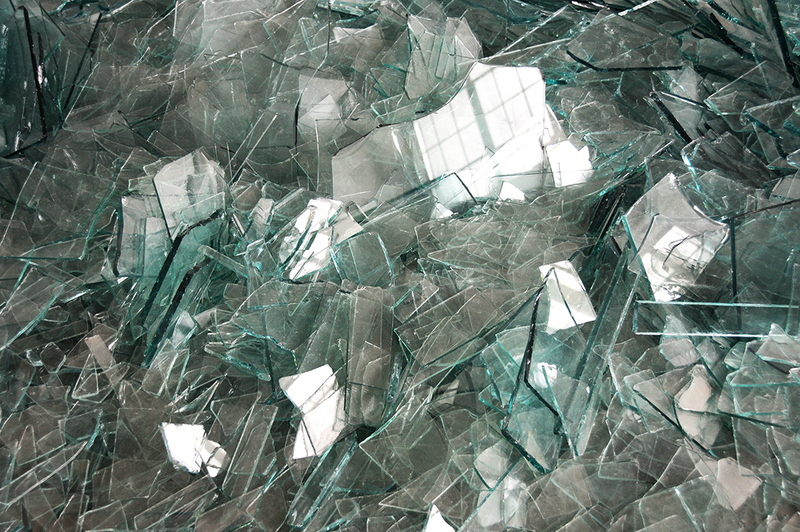 Depending on where you stood you could see the individual pieces alone or altogether. In another room he had a big wall of circular lights and two very colorful pieces which were my favourites- the way the colour just leaches out and blends together on the wall, I just can’t get enough of this stuff. 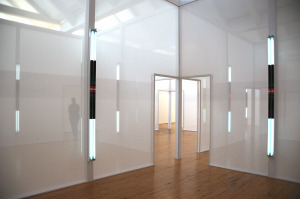 How can light be so tactile? 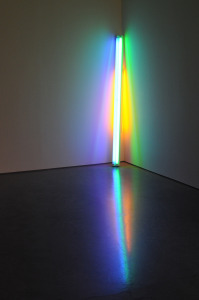 Although Flavin’s work was my favorite, I just can’t believe how much of the other work I absolutely loved! Lol, I must have been feeling very receptive that day! 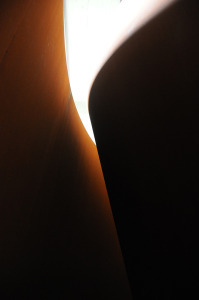 Entering Richard Serra’s giant wraparound steel forms, Torqued Ellipses, particularly the ones which guided you between two leaves of steel was incredible. The walls slightly leaning, the space tight, daylight above you and that orange patina just waiting for your hand to touch it, it was unbalancing and awe inducing and yet protective at the same time. Robert Smithson drew a strong reaction too with a glass piece Map of Broken Glass, all I could think though was how much I wanted to jump on it and hear the sound of it all shattering. Don’t know what that was about but I’m pretty sure that was not the artist’s intention! Bernd and Hilla Becher were also well represented with a room of their industrial works, which fitted really well with the space and were actually a collection I hadn’t seen before- some really odd shaped tubings- one of them at least, a plant for making polystyrene. I am always torn with their work- how interesting the images are and yet as a photographer how I would find it so boring to always be working in that dull diffuse light with such a formulaic process. Robert Irwin’s Homage to the Square was a connecting set of mini rooms, walls of scrim opening one into another, a little bit maze like and offering up visual geometric puzzles there were fluorescent tubes too (but nothing compared to Flavin’s). Really cool space to enter into and other worldly looking through the scrims. 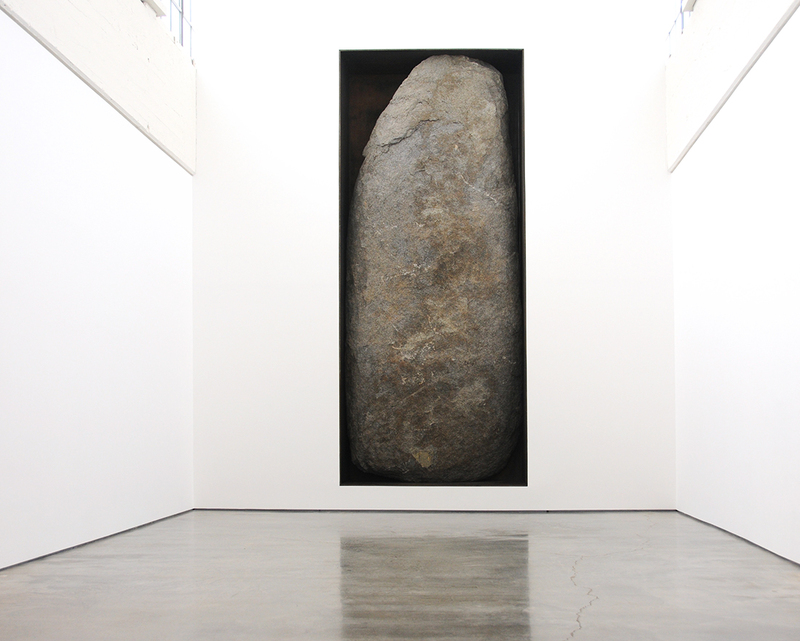 Finally Michael Heizer’s Negative monolith #5 (98) a giant rock squashed vertically into a recessed rectangular space that barely contained it. The power of this was terrific, sort of an idolatry piece, yikes! It certainly gave me a moment!